During its extremely short lifespan, the WiiU had a solid collection of games that never reached the audience they deserved. With the re-release of Bayonetta, Mario Kart 8, Pokken Tournament, and several titles to come, the most recent port to the Nintendo Switch is that of Donkey Kong Country: Tropical Freeze, a title that I found to be one of the more disappointing Nintendo games I've played in years. Let me preface this review by stating that I am not a huge fan of Donkey Kong. While some of you are now probably confused as to why I would shell out $80 towards a game knowing full well that I may not enjoy it, let me apply a bit of context here. Back when I was in high school, I remember having a gaming night with a friend who owned a Super Nintendo. I was always a Genesis kid, so seeing what the competition had always peaked my curiosity. Donkey Kong Country had just been released and it was unlike anything any of us had seen before. While the game never really did stick with me, I still recall the countless days we spent playing it, trying to master each and every level. 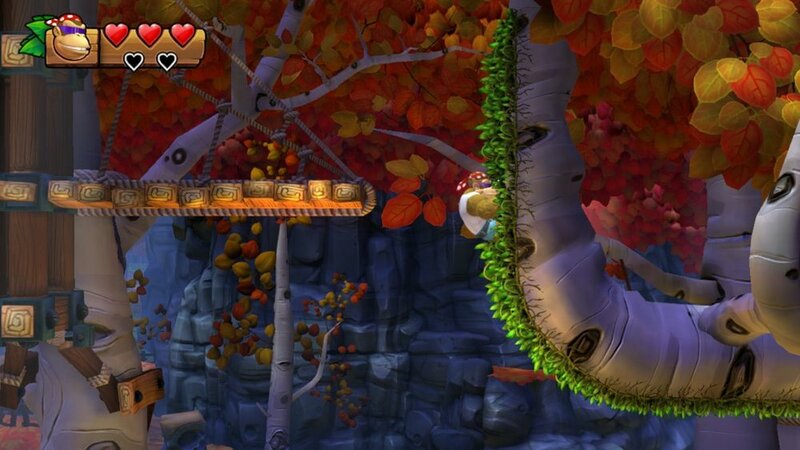 While it has been years since I have played a full-on Donkey Kong adventure game, I decided to jump in and see what was so great about Tropical Freeze. I had heard several good things from people I generally talk games with, as well as from those in the industry I tend to follow. I also like to think that even if a franchise is normally not something I am into, that if a game is good enough, I can usually set aside my issues or differences with the series and attempt to just simply enjoy it. While I agree that there is certainly a lot to like about Tropical Freeze, the issues I have with the game contributed to more frustration with the title than enjoyment. Donkey Kong Country: Tropical Freeze is a near-identical port to that of the WiiU version that hit that console some four years ago. While the game looks a lot cleaner visually, there really isn't much added here to convince players to rebuy the title or to pay the full purchase price when the WiiU version is far far cheaper than what Nintendo is currently asking for this marginal remaster. 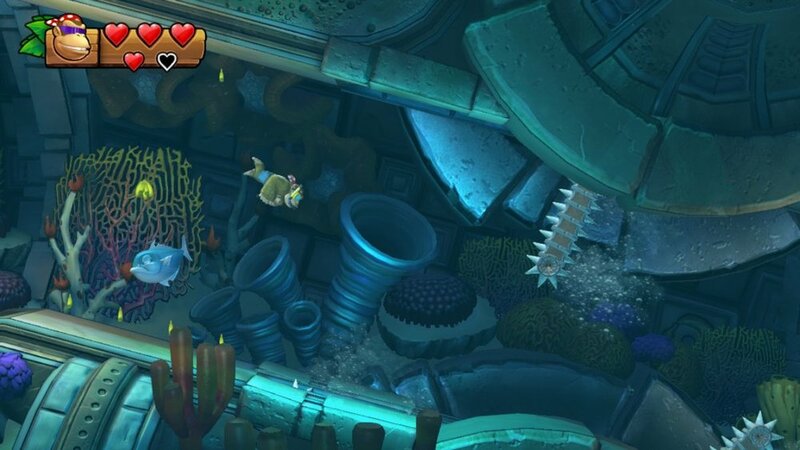 The only real bit of new content is the addition of Funky Kong mode, an easier setting that grants additional health and the ability to breathe underwater. As the original game was quite difficult, this is Nintendo's way to make the game a bit more forgiving, but not by much. Given the game has no dialogue, the story is told through a single opening cutscene. Donkey Kong Island is taken over by an army of Penguins, lead by Lord Fredrik, the Snowmad King. DK's tropical paradise is frozen solid, and through a series of 6 different islands, you will attempt to take back your home. Each of the colorful Island ends in a boss battle, and each stage hides various collectibles and secrets needed to unlock rewards like the secret seventh world. Many of the complaints I have are based on the game being largely inconsistent when it comes to not only its controls but the difficulty spikes that plagues most of the game as well. Some levels are far too easy and others fall at the other end of the spectrum and come off as not only unfair but incredibly cheap. The speed of several levels don't flow as nicely as others, and despite some very impressive level design here and there, many of the designs that fill this game are solely based on a painful trial and error approach. There were several levels that I would expend nearly 30 lives simply because of sluggish and unintuitive controls, unfitting of the normal polish expected from a game published by Nintendo. While there are certain mechanics that work well here, jumping isn't one of them. Regardless of jumping around to collect banana's or bopping off the noggin of a hovering foe, it never once felt precise or confident. I always felt I was trying to overcorrect myself too often and it would usually end up with me falling to my doom. Had Donkey Kong had movement systems to grab on to near-missed ledges, bounce off flat surfaces, or something to make small mistakes a bit more forgiving, then I would have a very different outlook on this game. Donkey Kong has a few basic actions; you can jump, roll, and continuously slam your hands on the ground like beating a drum. The latter is used to daze nearby foes or to smash boxes or platforms underneath you. The rolling isn't well implemented and I found myself rolling off cliffs to my death when all I wanted to do was destroy the platform beneath me or shatter the ice off a springboard. If you move even in the slightest bit while pressing the slam button, the game will assume you want to roll and it led to several unintentional deaths. Apart from these issues, Tropical Freeze does have some decent qualities that can make for a good experience. The mine-cart levels are fantastic and I would have preferred far more of them and less of the swimming and barrel riding scenarios, mainly due to the poor controls for each of those activities. The special stages you can unlock to gather banana's and puzzle pieces were always satisfying to discover and It complimented the explorative aspects of the level design. While the boss encounters are not terribly original, they were still satisfying and some of the best parts of this game. My only issue with the boss encounters is in the design of the final boss. His showdown was lacking and could have benefitted from the battle shifting to new and more challenging forms. Had a boss battle been designed around the mine-carts, well, that would have been something special. 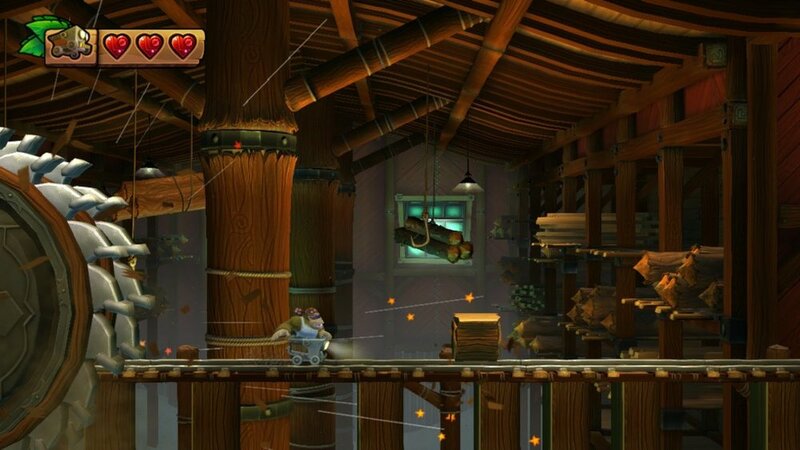 Tropical Freeze lets you play mainly as Donkey Kong or Funky Kong, the latter having more hearts and the ability to breath underwater, as well as letting you bypass difficult levels should you die too often. 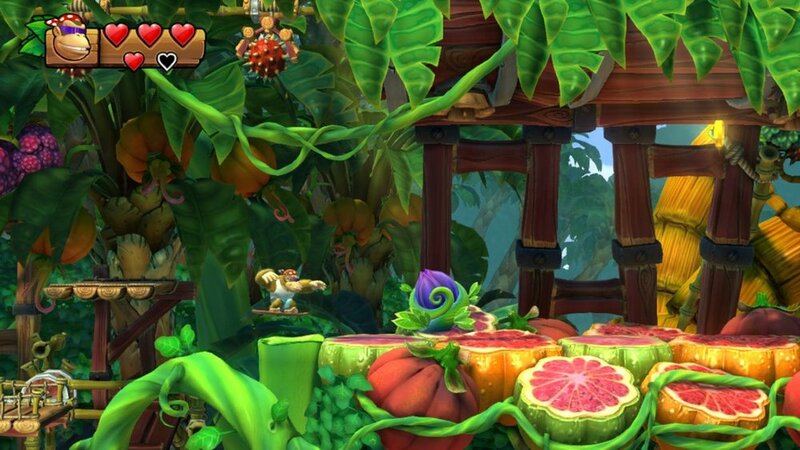 You can also recruit Diddy, Dixie, and Cranky Kong, with each having different abilities. The issue I have in regards to your sidekicks is in the method you have to recruit them. You will stumble across barrels that rotate around with initials representing each of your companions. If you accidentally select the wrong barrel, you are stuck with that character until the following barrel. As Funky Kong, you can't recruit these characters and instead, he tends to envoke a few of their abilities on his own as he can double jump and spin his surfboard into the air to glide to safety unless of course, you miss a jump, and you will. The level design is often wonderful and yet frustratingly brutal when it is not. If the controls had been tighter and the jumping more intuitive, then maybe many of the flaws in certain environments would evaporate in an instant. The visuals of each location are stunning, the concepts behind many of the death traps that await you are well designed and when a level has a consistent fluidity to it, it is a work of art. There are times, however; where that fluidity is halted and it led to so many deaths that I am glad the coins to purchase them are plentiful. There is a level late in the game where you are racing against time on the back of a rhino and instead of the level opening up to compliment this urgency, it has small pauses in lining up certain platforms to assist in your escape. This causes you to have to pause your speed, wait for the platforms to sink into the lava and then continue. It is these pauses that hurt a game like Sonic, a game built around speed. While DK isn't quite that type of game, the design of the level here is something that borrows from that concept and does it poorly. The last thing I will touch upon is that the issues I have with the game are almost solely around its controls and the spikes in its difficulty. If you have no issues with either of these then Tropical Freeze can entertain you for hours on end and could easily score an 8 or 9 for you, so don't let my review sway you should you not share in the same issues I have with it. The game is full of great ideas, but its gameplay just didn't feel right for me and I wasn't always having fun, and that is not a good thing when it comes to wanting to get the most out of your investment. 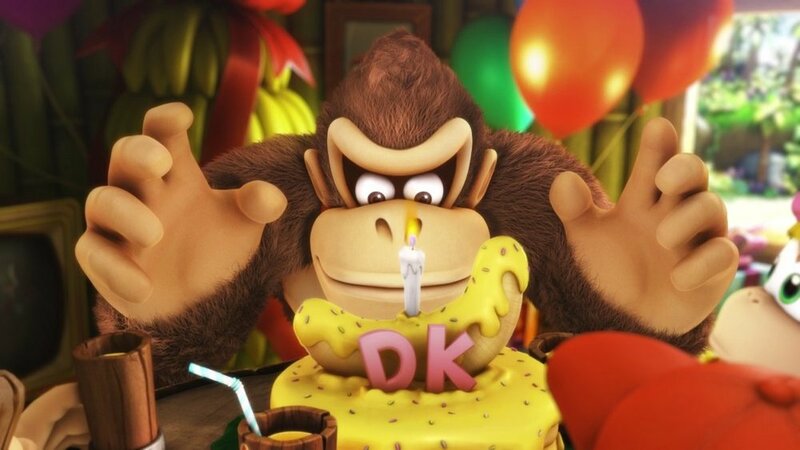 Should Nintendo make a brand new Donkey Kong game for the Nintendo Switch, then I am totally up for trying it out, it's just a shame that Tropical Freeze didn't make me a believer. 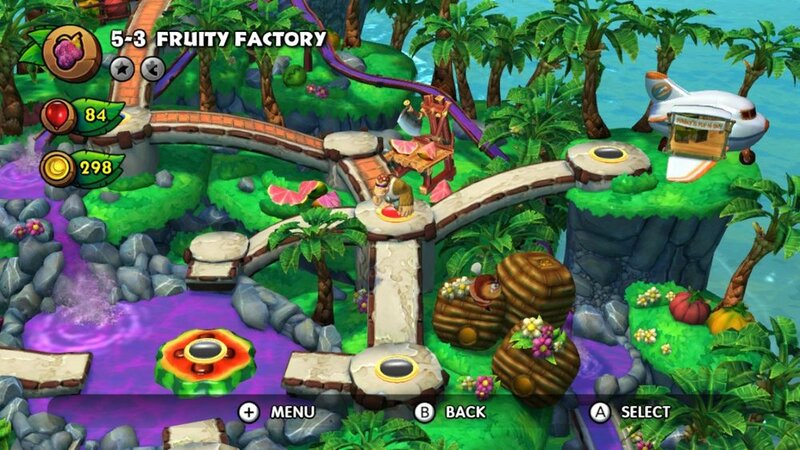 donkey kong Country- Tropical Freeze WAS PURCHASED BY THE REVIEWER.